As competitors, baton twirlers so often feel judges are intimidating foreign entities sitting behind rickety old tables clutching stopwatches and waiting to mark penalties. As a judge, the adjudicators of our sport only want twirling athletes to succeed-where does the translation get lost? When UI drum major Analisa Iole stepped onto the Kinnick Stadium football field this past fall, she was celebrated as the Hawkeye Marching Band's first female major since WWII. But who were Iole's predecessors, the women who served as leaders in the community while U.S. service members (including Nile Kinnick) were overseas? Have you ever seen a baton twirler perform? They manipulate a metal stick in magical ways: rolling it between their fingers, tossing it 20 feet into the air, and catching it between their legs or completely blind behind their head. If you have seen a baton twirler, it was likely a young woman in a bedazzled swimsuit-style costume. Nine-year-old Ciaran Muir wears a V-neck top bedazzled with lime-green rhinestones while cartwheeling through a Scottish field and hurling a two-foot rod in the air. He sports calloused hands and six-pack abs, gained through countless hours of training in the physically demanding sport of baton twirling. 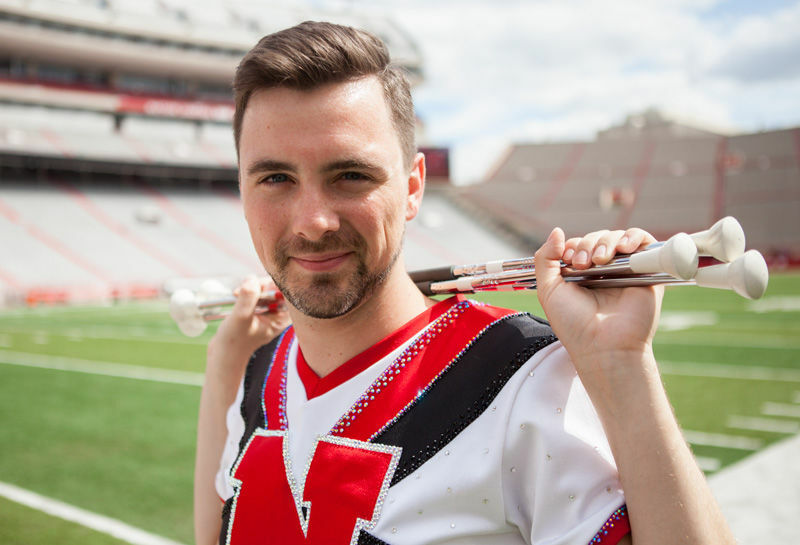 ​Trenton M. Haltom is one of only three male baton twirlers in the University of Nebraska-Lincoln’s history. He's aware of the stigma attached to male twirlers, but he's been fascinated by it since his mother used to twirl, and he was taking lessons by the time he was 16.